On our way from the Almanity Hoi An Resort and Spa to the Pullman Da Nang Beach Resort, we arranged to stop at the Marble mountain. We agreed to do a quick visit four about 20 minutes. This seems to have been an okay amount of time, but may have been better to have about 30-40 minutes. However, we were not charged extra for our trip from Almanity to Pullman with this stop, so we took what we could get and made the most of it. 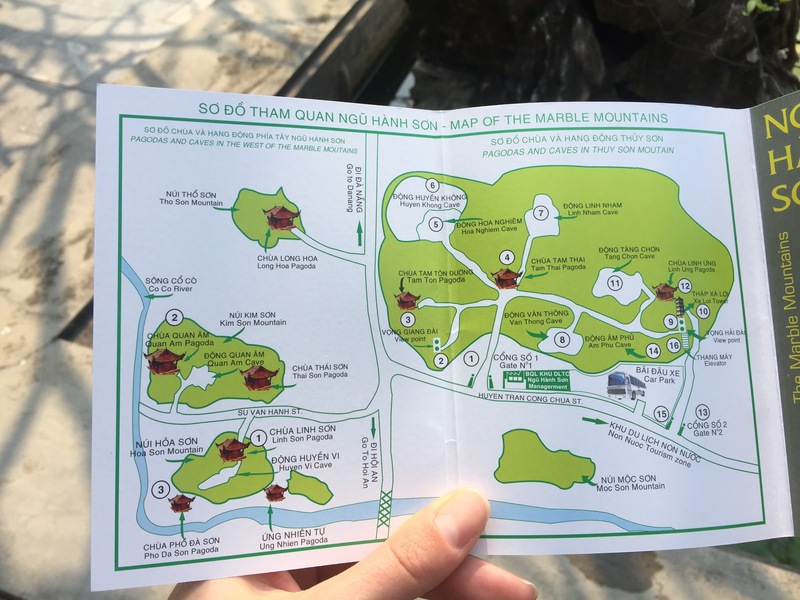 Entrance to the mountain is 15,000VND per person. They have built an elevator to bring you up to the top, so you can opt to take the stairs or pay 15,000 VND per person per way to use the elevator. We chose to take the elevator up, mostly because we were on a time crunch and we weren’t really sure how many stairs it was to get to the top. It turns out this was a great choice and even if you are fit and can climb the five flights of stairs no problem, we still recommend doing the elevator up. It is a glass elevator and you get a beautiful panoramic view of the town and outskirts of the mountain. We walked around the grounds and were astonished at the immense marble buildings and shrines as well as the fine detail of each piece. Below is a photo of the map. They charge you for a copy of it when you get your ticket but there is a giant one at the top that you can look at so no need to purchase one. We missed the caves, but were able to catch some zen with the giant buddha at the end. We were also amazed by the incredible dragon sculpture across from the buddha. We took the stairs down, which were also made of marble and were slightly uneven. Definitely keep track of your footing on the stairs. We walked back to the car and as per usual asked to take a look in the shop where we had stopped to park the car. There were some very nice marble statues, but nothing that would fit inside our backpacks so we made our way to the van. We arrived at the Pullman Da Nang Resort and Spa and spent the day there. We talk about our time at this resort in another blog post. In the evening we ventured into the city of Da Nang. Our first stop was a place for noodle soup, a different kind than we had been eating during the trip: mi quang. Mi Quang Ba Mua (19 Tran Binh Trong Street) was empty when we walked in, but after we ordered the place began to fill up very quickly. The group next to us ordered fresh spring rolls, which also looked amazing and a vietnamese couple order the same thing as us, so we knew we didn’t go wrong. The noodles were the same white noodles we had seen being made in the market in Hoi An during our cooking class at the Almanity. They were similar to udon noodles, but not as heavy. We ordered the soup with pork, but Jess is convinced it wasn’t pork and that it was cat or something else. We definitely had a little challenge with the language barrier and found the bill came to a little more than we expected. We were told we had ordered the special, which further proves Jess’ theory of it not being pork… I guess we will never know! Regardless it was very very good. The soup had fresh herbs, a little heat to it and very tender meat on top. We were also given a large rice cake to share and we enjoyed a beer as well. 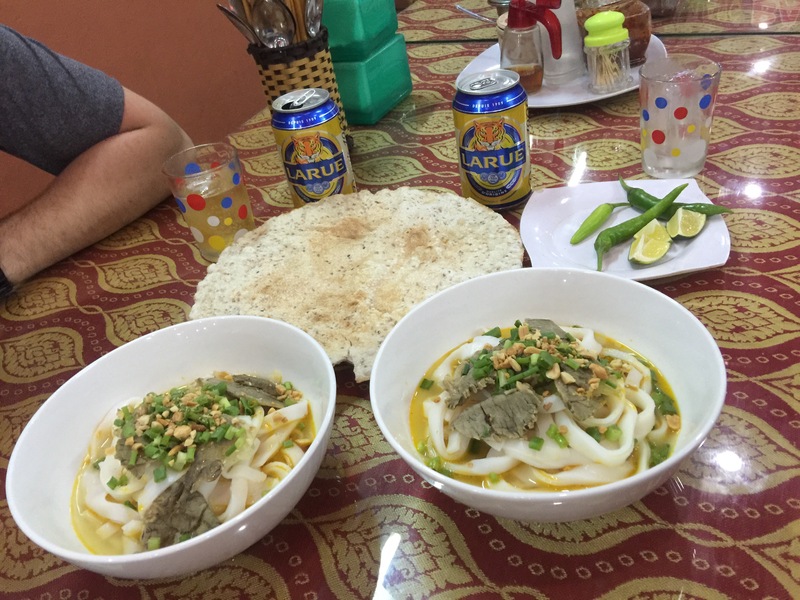 The whole meal came to 95,000 VND. After dinner we decided to go over to the water and walk up and down the street along the water to look at the bridges that are lit up at night. All of the bridges over the river were lit up. Every few minutes the dragon would change color; it was quite the sight. We walked up and down the street along the water, which was very relaxing and enjoyable. There were locals line dancing and some people selling souvenirs, of course. On the opposite side of the street from the water, there were restaurants and bars lined up one after another. This area is recommended for a variety of international and local cuisine as well as bars with cheap and good drinks. We had a really nice time and took an uber back to the hotel at the end of the night. Our time in Da Nang was short, but for a city it didn’t seem too short. I’m sure there is a lot more to see, but we were definitely excited to get to Ho Chi Minh the next day.